On our home page, we dared to make what you may have thought to be a rather preposterous claim – that there was “one thing” you could do that would change your whole life. And what was that one thing? R e m e m b e r t o b r e a t h e ! You may also remember that we admitted maybe it wasn’t quite that simple. We explained that what we really meant by “remember to breathe” was remembering to activate your mid-prefrontal cortex (MPFC) – because whenever you activate your MPFC, it naturally goes about its job of getting the different parts of your brain to work in harmony. When the different parts of your brain are working in harmony, your brain as a whole naturally goes about balancing and harmonizing your mind, your body, and your emotions. That’s why one little thing like “remembering to breathe” can have such a big effect on your life. 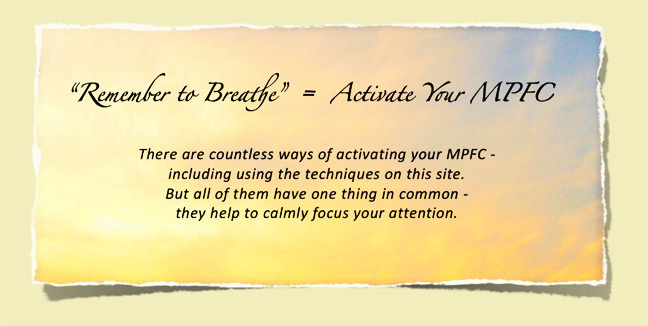 We then went on to say that one of the quickest and easiest ways to activate your MPFC is by becoming calmly aware of your breath. Even though you’re always breathing, you’re not always aware of your breathing. Most of the time, you’re probably so busy thinking about or doing other things that you just don’t notice it. But when you’re at all stressed out, quietly observing your breath can be a powerful way to help you shift into a state of greater calm and ease. There are a variety of breathing techniques that you can use for more specific purposes as well. In addition to activating your MPFC, there are breathing exercises that can balance your autonomic nervous system, wake you up, calm you down, balance the left and right hemispheres of your brain, activate your heart brain, or help you evoke positive emotions. In fact, if breathing exercises were the only techniques you ever used, they alone could take you a long way toward removing obstacles to optimal functioning of your MPFC – the obstacles that keep you from connecting to a state of calm, ease, contentment, and harmonious connection to others. So maybe our claim turns out not to have been so preposterous after all. Before attempting to learn and apply any of the other techniques on this site, we strongly suggest that you get some of the basic breathing exercises under your belt. One reason we say this is that breathing exercises make all the other techniques far more powerful. In fact, most of the other techniques incorporate breathing exercises either as a preparation, or as integral part of them. And no matter what kind of change you wish to make in your life – whether it’s decreasing physical pain, losing weight, changing your job, or changing your mood – breathing exercises are an invaluable tool to have in your pocket. Another reason why breathing exercises are a good place to start is that they can be easy to learn and enjoyable to practice. And as you may have discovered, when practicing is enjoyable, you’re more likely to do it – and you’re more likely to feel good about the whole endeavor of training your brain to change your life. But you don’t have to take our word for it. If you have a moment, why not try some for yourself? There’s no need to change how you’re breathing – in fact, this exercise works best when you just observe what your breath is doing without trying to interfere – though it may start to change on its own. You may find that you notice the movement of your chest or belly as you inhale and exhale. Or you may notice the changing sensations in your nostrils as the air flows in and out. Just continue quietly observing the breath for three more cycles of inhalation and exhalation. Don’t be concerned if you don't notice much after this brief try. Whatever you may have felt or not felt, to the extent you were able to focus, you just activated your mid-prefrontal cortex, which means your brain is now slightly better equipped to think clearly and to be less emotionally reactive. Gently breathe in to a count of 3, and breathe out to a count of 6. Now do it again three more times. Breathing out longer than you breathed in just activated your parasympathetic nervous system which slows your heart rate, lowers your blood pressure, and releases a whole cocktail of hormones and neurotransmitters that work to relax your body and calm your mind. There are other breathing exercises – as quick and simple to learn as the ones you just tried – which can energize you when you’re tired or relax you when you’re tense. There are others that can balance the left and right hemispheres of your brain, and still others to help you evoke positive emotions. We invite you to explore the amazing world of breathing techniques. You’ll find that the many riches of brain integration and well-being can be literally just a few breaths away.